Generate's New York web design conference returns. If you work in web design or development then you'll want to attend Generate NYC on 25-27 April 2018, for lots of good reasons, and here are 10 of them. We've gathered together some of the biggest names in web design for Generate NYC 2018 to share their knowledge and inspire you to create better work than ever before. Our stellar line-up includes Donna Lichaw, Dan Mall, Wes Bos, Val Head, Cynthia Saucier, Jenn Lukas, Abby Covert, and nine other great speakers. Check out the whole lot. Generate NYC has moved home! The conference will take place at the Metropolitan Pavilion in Manhattans desirable Chelsea neighbourhood. A beautiful open space, close to subway lines and hotels, this is the perfect venue for our fifth Generate in NYC! Check out their site for hotel deals. The event will also give you an inspiration boost. If you're running low on creative energy it can be easy to let your work become mundane. Attending events like Generate puts you in a room with energised, vibrant people who will remind you why the web is amazing and give you new perspectives from which to view your contribution. Ever found yourself torn between two equally appealing conference sessions happening at the same time? That's not a problem at Generate NYC, as for the first time it's a single-track programme, which means you'll be able to attend all the sessions without missing out on anything. Also, videos and slide decks of all the sessions will be made available to attendees after the event, so you can dig deeper and don't have to spend ages taking notes. You can then even share them with the rest of your team. In fact, sharing what you've learnt is positively encouraged! Up your skills and get ahead of the game; book your Generate ticket today! 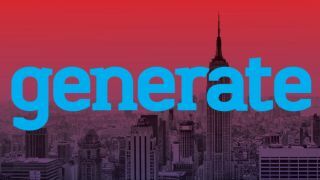 As well as two days of inspiring and practical talks, Generate NYC also features an entire day of in-depth workshops. On 25 April, you can learn new skills from the best in the business. As well as a lineup of quality speakers, Generate NYC also offers a great opportunity to forge new contacts among the other attendees. Whether it's during one of the session breaks, or later on at the post-conference happy hour, it's the perfect chance to meet other web professionals and expand your network. If you're not offering up-to-date services then you can be sure that potential clients will seek out other studios and agencies that do. Generate NYC is the perfect place to boost your skillset and get insight into where you should be focusing your efforts for the future. If you're not there then you can be sure that your competitors will be. Don't get left behind; book today! Attendees will receive a jam-packed Generate goodie bag full of useful content, including the latest copy of net magazine. Lunch and refreshments will also be provided every day. Of course there's also a party, where you'll have a chance to do even more networking with the speakers and fellow attendees. The party will take place straight after the first conference day on Thursday evening. Venue TBC! There is a variety of ticket options to suit everyone's schedule and budget. You can book a workshop-only pass, a single- or two-day conference pass or a full conference + workshop pass. There's also a student conference pass.